JACKSONVILLE, Fla.--(BUSINESS WIRE)--Today, Southeastern Grocers, parent company of BI-LO, Fresco y Más, Harveys Supermarket and Winn-Dixie stores, announced that they are saying goodbye to Plenti and will begin providing customers with rewards from an old friend. This summer, Southeastern Grocers will introduce a new loyalty program, SE Grocers rewards, which will allow customers to redeem points on groceries and fuel at participating Shell or other select fuel stations. Anthony Hucker, President and CEO of Southeastern Grocers said, “We are committed to providing a loyalty program for our customers and associates that will best meet their everyday needs. We have listened loudly to our customers about all of the things they value with our current rewards program and how we can make our next loyalty program even better. We are excited to announce that our customers will soon be able to redeem rewards for savings on fuel at participating Shell or other select fuel stations and on groceries through the SE Grocers rewards loyalty program. Customers can continue to earn Plenti points in BI-LO, Fresco y Más, Harveys Supermarket and Winn-Dixie grocery stores through July 10, 2018 and the unredeemed points value earned in stores will be issued to the SE Grocers rewards program when the new program is launched. Customers must be fully registered in order to use points now or take the points value to the new SE Grocers rewards program. To ensure an easy and seamless transition, customers can visit bi-lo.com, frescoymas.com, harveyssupermarkets.com, or winndixie.com to check the status of enrollment. 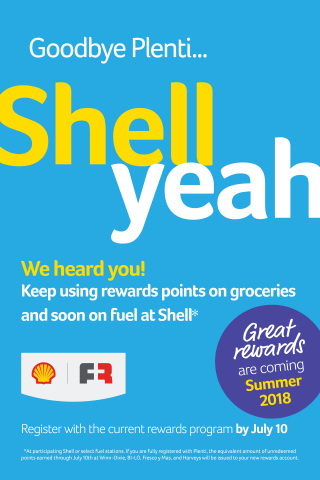 Great rewards are coming this summer – welcome back, Shell! For general questions about the future rewards program, please call 1-866-946-6349. Excentus Corporation, a PDI company, is a leader in loyalty marketing and technology solutions, specializes in the design, development and implementation of loyalty programs. Since 2012, Excentus has operated its own nationwide loyalty program, the Fuel Rewards® program, which has grown to more than 13 million members and $1 billion in fuel savings. Excentus offers a full suite of loyalty products and solutions for national and regional brands, grocery chains, consumer packaged goods manufacturers, convenience retailers and their customers. For more information about Excentus’ loyalty marketing and technology solutions, visit www.excentus.com.